name4carl/How Can a Feature Be Named For Carl? Use of this site means you accept its terms and conditions. HOW CAN A FEATURE BE NAMED FOR CARL? 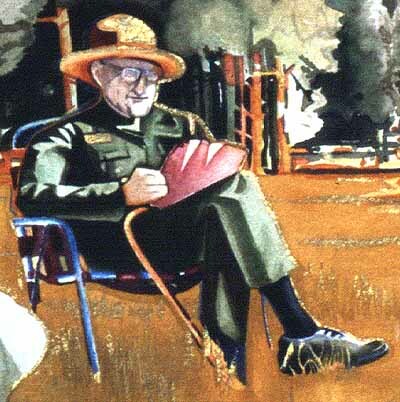 Ranger Carl, Watercolor detail by Diane Detrick Bopp at www.yosemitemusic.com, used with permission. Names in the United States that are printed on federal maps are determined--under Public Law 242--by the Domestic Names Committee of the U.S. Board on Geographic Names, an agency within the U.S. Geological Survey of the Department of the Interior, and composed of at least one representative from each of the Departments of State, War, Navy, Post Office, Interior, Agriculture, and Commerce, and from the Government Printing Office, and the Library of Congress. The Board maintains a website at http://geonames.usgs.gov/pppdgn.html: exits this name4carl site where their policies, procedures, and practices are stated, summarized below:. The Board accepts proposals from agencies, organizations, or the public. Proposals may be made to change established map names, or new names may be proposed for otherwise unnamed features. A name that is proposed is sent for input to cooperating Federal, State, local governments, and tribal agencies and to interested organizations and individuals about 3 months before the meeting at which it is to be considered. Each decision of the Board is guided by existing principles and by factors involving established, historical, legal, legislated, written, and verbal usage. Additional time for review may be granted. When decisions are reached, they are submitted to the Secretary of the Interior for review and concurrence or rejection. Names can also be established by Act of Congress, and these take precedence over decisions by the Board. The Board will not decide on a name if it is also being considered by the U.S. Congress. Individuals for whom names are proposed must be deceased at least 5 years. The person being honored by the naming should have had either some direct and long-term association with the feature or have made a significant contribution to the area or State in which it is located. A proposal to commemorate an individual should contain evidence of local support for the proposed name and its application. Such evidence may be in the form of letters from local residents and administrative agency personnel and (or) petitions containing original signatures of local citizens. Past decisions by the Board have found "direct association" or "significant contribution" when the person being commemorated was a...person who played a large part in protecting the land for public benefit. The Board normally discourages use of more than a surname for commemorative names. The Board will not approve proposed names for unnamed features, names in local use but not published on a base series map, or unpublished administrative names used by administering agencies, unless an overriding need exits, such as for purposes of safety, education, or area administration. The administering Federal agency will review new name proposals and advise the ...Board...of its findings relative to overriding need. Persons wishing to name an unnamed feature in a wilderness area should coordinate their proposal with the Federal agency responsible for the administration of the area. Renaming features is not encouraged by the Board "except in rare cases such as those involving certain derogatory names and name duplications." Indicate the full form of the geographic name proposed. If the proposed name commemorates a person, give the full name of the person, birth and death dates of the person, a short biography of the person to be honored indicating his association with the feature. Board review is expedited if the proposal furnishes evidence of local support; this may be in the form of letters from appropriate Federal, State, tribal or local administrative authorities and State or tribal geographic names authorities; petitions for the name signed by local residents; newspaper clippings of articles and letters to the editor showing public awareness and endorsement of the proposed name. Proposals may be directed to Roger L. Payne, Executive Secretary of the Board and for Domestic Names Committee, U.S. Board on Geographic Names, U.S. Geological Survey, 523 National Center, Reston, VA 20192-0523. Phone: 703/648-4544. Fax: 703/648-4549. E-mail: rpayne@usgs.gov. Information from the Board on Geographic Names Frequently Asked Questions is attached--go to BGNFAQ. In the Summit Daily News of November 10, 2003 (page A2), Carl Drews is reported to be proposing the name Pacific Tarn for the highest lake in the United States (an unnamed one), in Summit County, Colorado. "We don't know that it's been called anything before," said Paul Semmer, a Forest Service community planner, "and by default that makes us unopposed to it being named." The geographic names board said, "Sitting here in Washington, D.C., we really don't care what people call it, as long as the local authorities agree," said Jennifer Runyon, the board's staff researcher. In the Summit Daily News of November 10, 2003 (page A2), it appears that Shrine Ridge near Vail Pass, Colorado will be formally named Wingle Ridge after a Forest Service employee who was involved in ski hut associations. The paper reports "No opposition in Summit or Eagle counties materialized, and county commissioners in both counties endorsed the name while the U.S. Forest Service indicated no problems." In the Summit Daily News of November 10, 2003 (page A2), two unnamed peaks southwest of Leadville, Colorado were renamed after Carl Blaurock and Bill Ervin, the first two people to climb all 46 peaks then considered to be fourteeners in Colorado. In the Summit Daily News of November 10, 2003 (page A2), a proposal to name two peaks near Lake City, Colorado was rejected owing largely to the fact that the peaks are within areas being studied for potential wilderness designation. In the Summit Daily News of January 12, 2004 (page A3), "A ridge near Vail Pass colloquially called Shrine Ridge has officially been named after longtime U.S. Forest Service employee Pete Wingle...From the 1970s to 1996 Wingle oversaw recreation on U.S. Forest Service lands in Colorado and some peripheral areas. As such, he was a key figure on behalf of the Forest Service in the development of Copper Mountain. Wingle was also an advocate of, and a participant in, less-developed back-country activities...He was also on the board of directors for both the 10th Mountain Hut Association and the Summit Huts Association...Wingle 'really made a significant impact on primarily outdoor winter recreation in Colorado', said Bob Moore, the former state director of the Bureau of Land Management in Colorado. Moore submitted the proposal to the U.S. Board of Geographic Names (sic. ), which has authority of names on federal lands. The board unanimously approved the name in November after getting letters of support form county governments in both Eagle and Summit counties." An-mail to Bill Jones received My 16, 2006, from Ron Mackie gives his experience in a naming proposal: "I would be honored to help you and your distinguished group in pushing for a peak name for Carl Sharsmith. What little I know about the process involves some experience getting a small peak named for Orlando Bartholomew (High Odyssey by Gene Rose). I know its critical to get the support of the Park Superintendent and Regional Director. I also understand you can sometimes circumvent the process through the support of the local congressman, George Radanovich in this case. You probably know all this already. By the way we were not successful in Orlando Bartholomew situation. Never could get the USFS on board." See the Supporting Statement of Ansel Adams for the name Mount Ansel Adams, a name that was approved by the U.S. Board on Geographic Names within existed legislated wilderness, in contrast to naming policy today (what was the policy then?) A reference for this naming is Sierra Club Bulletin, Jan-Feb 2003, p. 39: "Shortly after [Ansel Adams'] death an 11,760-foot mountain on the Lyell Fork near Tuolumne Meados-...was named after him." Amelila Earthart Peak was formally named in 1967 in the backcountry of Yosemite National Park, although opposed by the park. At the time the area was not legislated wilderness. Policy (re: name changes); sec. 2: Conforming to Local Usage: It is the policy of the Board to follow present-day local usage whenever possible. However, the Board will consider proposals to change official names that do not agree with well-established local usage or its applications. Considerations other than local usage may be overriding in certain individual cases. Factors such as Board policies, document usage, population density, and State, tribal, and local governmental needs are always considered in Board decisions. Sharsmith Peak is the name used by Yosemite Association hiking guide Julie Miller to identify the peak herein proposed to be named. This name appeared in print in the Association's announcement of their 2002 Great Outdoor Adventures program, as "Julie Miller will guide her group to the summits of Tuolumne Peak, Tenaya Peak, and Sharsmith Peak." Beth Pratt of the Yosemite Association in 2003 noted that Sharsmith Peak is the name used by park insiders for this feature. And the authors O'Neill noted in 2002 in their hiking guide to this region that there was an interest in naming the peak for Sharsmith. Other names have been used for this peak (False White and False White Mountain Peak), but those using them favor the name Sharsmith Peak. The peak has also been known as Peak 12,002 for a reference to its summit printed on an earlier USGS map. Go to "Which feature should be named for Carl?" for more information on these past usages. Policy (re: commemorative names); sec. 1: The U.S. Board on Geographic Names will consider proposals for assignment of the names or nicknames of deceased persons to geographic features in the United States and areas under the jurisdiction of the United States. The Board will not consider names that commemorate or may be construed to commemorate living persons. In addition, a person must be deceased at least 5 years before a commemorative proposal will be considered. Carl Sharsmith passed away 1994, thus in 2006 a proposal to formally assign his name to informally-named Sharsmith Peak meets this 5-year criterion. Policy (re: commemorative names); sec. 2: The person being honored by the naming should have had either some direct and long-term association with the feature or have made a significant contribution to the area or State in which it is located...Past decisions by the Board have found "direct association" or "significant contribution" when the person being commemorated was a...person who played a large part in protecting the land for public benefit. For a half century Carl had intimate and continued presence in the High Sierra of Yosemite. He led short, all-day, and seven-day interpretive hikes for more than six decades in the upper Tuolumne River basin. He was a renowned wilderness and national park philosopher, scientist, teacher, and inspiration to the thousands of visitors who accompanied him on these high Sierra hikes. Carl mentored Yosemite’s Chief Park Interpreters, teaching them his charismatic educational skills to those who themselves were also teachers (broadly widening his web of educational influence). Sharsmith was the greatest interpreter of the wild and scientific values of the High Sierra since John Muir. Virtually every person who attended one of Carl’s seven-day high sierra hikes became a lifelong defender of the Sierra’s pristine values. By happenstance Carl’s tenure in Yosemite corresponded with the park’s continual quest to understand and manage meadow encroachment by forests, fuel buildup during times of maximum fire control, visitor overuse reducing the wilderness experience, air pollution dimming the vibrant visibility of the Sierra viewscapes, and over-development of visitor facilities. His was the constant voice rationally interpreting these concerns. With his intimate knowledge of the Sierra he had, and used, a special knack to have visitors at the very most special place, in the best light, and the best circumstance to discover themselves either the highest beauty, the obvious ecological lesson, or the most singular landscape. Carl was an artist who let you be the discoverer. Policy (re: commemorative names); sec. 4: All commemorative name proposals must meet the same basic criteria required of any other name proposal...A proposal to commemorate an individual should contain evidence of local support for the proposed name and its application. Such evidence may be in the form of letters from local residents and administrative agency personnel and (or) petitions containing original signatures of local citizens. For expressions of local support for naming a peak for Carl, go to "Summary of Supporting Statements". For remembrances of Carl, the man and ranger-naturalist, go to "Selected Impressions and Remembrances of Carl Sharsmith"
Policy: In States with no official State names authority, approval must be obtained from local governing bodies such as the county commissioners or supervisors or the town selectmen. California has the Advisory Committee on Geographic Names: exits name4carl.org, with the purpose of advising the federal Board on Geographic Names regarding names within the state that are or will be used in federal publications and maps. This body falls within the California Resources Agency. Policy (re: in wilderness); sec. 1: Within wilderness areas, the U.S. Board on Geographic Names will not approve proposed names for unnamed features, names in local use but not published, or unpublished administrative names used by administering agencies, unless an overriding need exists, such as for purposes of safety, education, or area administration. The summit of informally-named Sharsmith Peak is not within a wilderness area, for it lies at the edge. Formally naming this feature Sharsmith Peak will enhance education relating to natural history (ecology) and wilderness values in that the public will continue to be aware of the philosophy and appreciation of the wild qualities of the Sierra Nevada that Dr. Sharsmith so effectively championed and continues to symbolize. A safety concern also arises in that the point in question bears four informal names among its user communities: Peak 12,002, Sharsmith Peak, False White, and False White Mountain Peak, leading to potential confusion and thus hazard among hikers and skiers seeking directions, as well as park and forest and county sheriff management in referring to this point, critical during potential search and rescue operations in the area. At least one such situation occurred in January 1982 when an airplane crashed into a ridge on the peak, killing the pilot and his wife, but not 10-year old son Donnie Priest, who was rescued 5 days later when the snow that had temporarily buried the plane blew off. Donnie's legs had frozen and had to be amputated, however. Daniel Anderson, a ski mountaineer, favors using the name Sharsmith Peak rather than False White (see his statement). The group summitpost.org reports on its website "White Mountain is frequently confused with "False White Mountain", which lies just to its southeast." Policy (re: in wilderness); sec. 2: Name proposals commemorating persons are discouraged and will not be considered unless the criteria in Section 1 and the Commemorative Names Policy are met. The criteria mentioned have been addressed in the foregoing. Policy (re: long names); sec. 1: The full name of a person as the specific part of a geographic name normally is not approved. The form of the name Sharsmith Peak meets the Board's preference. "Geographic Naming in Wilderness. In order to maintain the untrammeled character of wilderness, the naming of additional geographic features is discouraged. The National Park Service will not propose to the U.S. Board of Geographic Names, nor support proposals by others, to apply new names to geographic features within any category of wilderness. An exception to this policy may be considered on a case-by-case basis when a proposed name: (a) serves a useful educational or interpretive purpose; or (b) is linked to an historical figure, activity, incident, or resources having a direct association with the geographic feature; and (c) meets all other National Park Service and Board on Geographic Names policies applicable to geographic naming." The policy applies to features "within...wilderness". "Within" means "inside". Sharsmith Peak is not "within" or "inside" wilderness, but at its edge. Even if it is semantically construed that because the western flank of Sharsmith Peak is "within" Yosemite wilderness, the eastern flank is not "within" wilderness. Too, naming the peak Sharsmith Peak qualifies as an exception to the policy as provided, for naming the peak will a) serve as a future reminder of the value of education and interpretation in understanding not only Yosemite and the Sierra Nevada but the ecology of planet earth, and b) recognize the important historical figure Dr. Carl Sharsmith whose name is already in use for the feature, and c) meet all other naming policies as shown in the analysis at the start of this section.